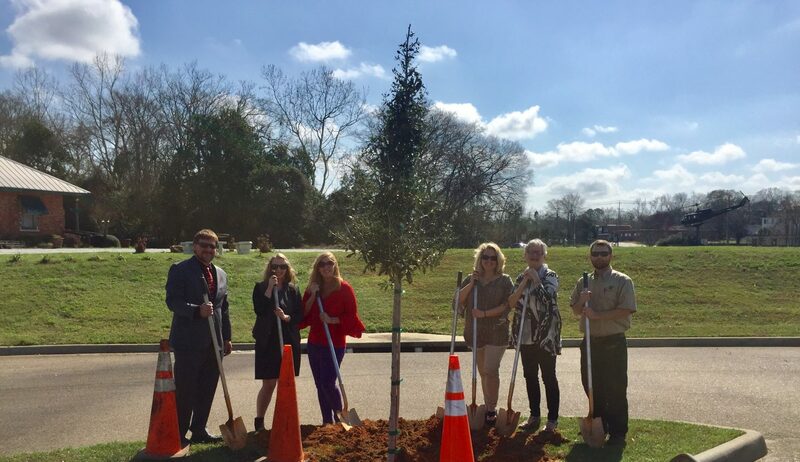 The Wiregrass Museum of Art was recently selected by the City of Dothan to be the recipient of its annual Arbor Day tree planting. A live oak was chosen and was planted on the museum’s grounds. Dothan is an official Tree City USA community, one of 71 in the state, and the City has participated in the program for 27 years. Each year an organization is chosen to receive a tree, and WMA was honored to be selected this year in the City’s efforts to put a spotlight on the contribution of the arts in the community. Below are the remarks of WMA Director and Curator at the tree planting ceremony, held on Thursday, February 22. I’m Dana Lemmer, Director of the Wiregrass Museum of Art. I want to start by off this morning by thanking the City of Dothan and the Alabama Forestry Commission for sponsoring this event, and to Dan Williams for thinking of the museum for this year’s tree planting. Each year the City recognizes an organization or a cause that they feel is important to the community, and we are honored that they selected to shine a light on the arts this year. I was asked to speak to you all this morning about the importance of the arts in our city, and I have to say, that is a monumental task as we have many wonderful artists and organizations who contribute to the arts community here. So, I thought I would start by sharing a personal story with you, and an experience that has shaped my feelings about what the arts mean to Dothan. It was several months after I began working at the museum, almost eight years ago, that I saw firsthand the impact of the arts. It was during a program called Project Installation, where teams of high school students were locked in the museum overnight to create original installations in our galleries. For many of these students, they had never had any access to art, not at school and not at home. Having never made anything, they were given a theme, a very limited budget, and they were challenged to work together in the planning and execution of their piece. And I’m not exaggerating when I say that I saw pure joy on those kids faces. I’d never seen anyone so excited to have been dumpster diving for supplies. (It really was a small budget). As someone who had access to art education growing up, I was first struck by the idea that that opportunity didn’t exist for those students. But still, they created innovative and truly impressive works of art. Some of the installations incorporated electricity, one group used a collection of old household appliances that they had scavenged from a junk yard, and they illustrated themes like Revolution, Memory, and Privacy. It was an emotional couple of days for me, because I saw firsthand the problems they were solving with art, and its when I began to understand what happens when an organization exists to fill a gap on our community. I come back to that story a lot, and I’ve been thinking about that moment and that program lately because tomorrow we will have five teams of high school students at the museum from Dothan, Rehobeth, Enterprise, Chipley, and Blakely to create new installations for Youth Art Month. A few things have changed about the program over the years- Its called Out of the (Art) Box, and we definitely do not spend the night anymore. But what remains the same, is the opportunity for them to learn and work as a team, to define a problem and then solve it through creative thought. They will enhance their critical thinking skills, and they will build confidence. Think about how important those things will be when they go to college or enter the workforce. And art will still be a tool for them to solve problems. That’s the impact that the arts have in Dothan. I want to take a minute to recognize anyone here representing an arts organization. Thank you to all of you; this is a special group of people making big things happen. It doesn’t matter who you speak to, at which organization. Whether they focus on the visual arts, dance, theatre, or music, we all have these stories. We all have stories about how arts and culture touches lives. But the truth is, it’s about more than quality of life. If you think about art as a tool, the real impact is how the arts help each of us to solve problems in creative ways. I would challenge everyone here to think about the problems our community faces. Whether its conversations about education, workforce development and talent retention, social and economic development, even transportation, how can the arts (or artists) help to address needs in our city? The arts help to nurture our community, by engaging residents, defining shared values, and enhancing public space.The success of the arts is dependent on collaboration and it is the public/private partnerships in Dothan that allow many of our city’s arts organizations to succeed. As a token of our appreciation for this year’s tree planting, and to the City for their continued support, we want to offer a piece of art. We have ceramic planters, handcrafted by WMA staff, to serve as a reminder of this event and the relationship between art and nature, and ultimately about the relationship between art and community. Thank you!